It's the 4th of July! Summer is in full swing, school is out, work is closed, and it's time to relax with family and friends. The stress of planning a great holiday can be avoided with a few simple tips. 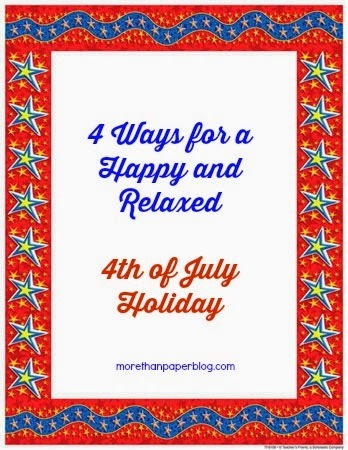 Follow these 4 ideas for a happy and relaxed 4th of July from More Than Paper! Don't cook. Unless it's something you really love to do, take the stress and pressure off by ordering from your local supermarket. Get a party platter with sandwiches, veggies, fruit, and make it a one-stop trip and pick up those adorable bakery cupcakes or pies. Plan ahead. If you are cooking, making desserts or specialty drinks, plan ahead. Make a list and check off as much as possible the day before, doing as much prep work as you can. Packing a picnic? Don't save packing it for last minute. Locate all your supplies (blanket, cutlery, napkins), food, drinks and more hours before it's time to leave for fireworks to avoid that last minute rush and saying -- "where the heck is that blanket?" Plan for downtime. With parades, local activities, plans to go to the beach or pool, cookout parties and fireworks -- it can be an action packed day. Recognize you can't do it all and choose a few of those things Make sure your day includes some "downtime" to just relax at home. If you have younger kids, make sure they get a nap in before fireworks. Make your own fireworks show. If you have young kids who won't be able to make it up for fireworks (usually after 9 pm in most parts of the country! ), host your own "fireworks" show. Get sparklers and confetti poppers and hold your own backyard party. Younger ones won't know the difference but still get to have some 4th of July fun! More Than Paper wishes you a happy, relaxed and safe Independence Day! Check out our website to see what's new for summer entertaining, camp, stationery and more!